A playground for outdoor enthusiasts, the Alps attract visitors year-round. Now that the snow is melting, and the temperatures are increasing, walkers from around the world descend on the Alps to try some of the best hikes in Europe. With so many hiking trails in the Alps to choose from, it can be difficult to know where to start when planning your walking holiday. To give you some inspiration, we’ve shared the best hikes in Europe in countries including; Austria, France, Italy and Switzerland. Nearest Airport: Transfers from Salzburg Airport to St Johan in Tirol take approximately 1 hour 10 minutes. Stretching a total distance of 413km across the entire breadth of Austria, the Eagles Walk features on many hiking bucket lists. Divided into 33 stages, the route allows hikers to tailor their experience according to their time availability and ability. Whether you are looking for a simple walk through the stunning Tirol scenery or a challenging hike over Austrian summits, the Eagles Walk offers the perfect route. Nearest Airport: Transfers from Salzburg Airport to Saalbach-Hinterglemm take approximately 1 hour 30 minutes. One of the best day-hikes in Austria, Pinzgauer Spaziergang follows an incredible route along a high spine of land in the Eastern Alps. 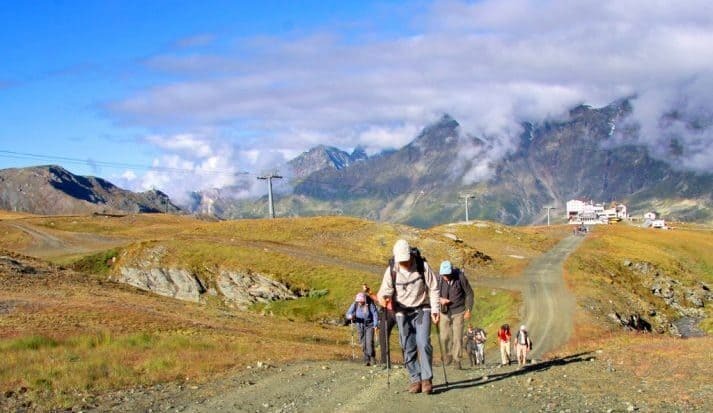 Showcasing the snow-capped summits of High Tauern and the Grossglockner (Austria’s highest mountain), intermediate walkers can complete the walk within 7 hours. 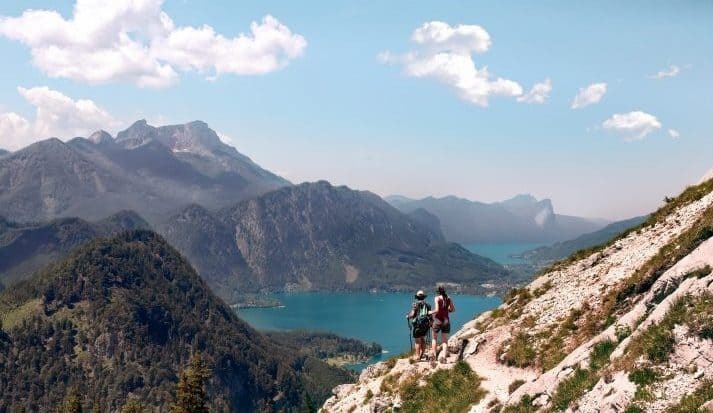 The perfect introduction to hiking in Austria, this route offers incredible mountain views and even an uninterrupted panorama of the Salzach Valley. Nearest Airport: Transfers from Salzburg Airport to Filzmoos take approximately 55 minutes. An incredible circuit of limestone pinnacles, the Gosaukamm Circuit is a lofty route that towers above the surrounding Austrian countryside. Although involving a degree of scrambling, this walk isn’t overly taxing. Best completed over 2 days, we recommend an overnight stay at the Gablonzer Hut, allowing you to relax on the terrace and enjoy the late-afternoon sun. Nearest Airport: Transfers from Innsbruck Airport to Mayrhofen take approximately 1 hour 5 minutes. An invigorating, long-distance hut-to-hut trek, the Berliner Hohenweg is a looped trail that is split into 7 stages. Passing a succession of mountain huts, including the 6,700 ft high Berliner Hut which the route was named after, it is best attempted between mid-June and the end of September over a duration of 7 days. Rising to nearly 10,000ft, the trek can be demanding in places, but with a good level of fitness and ample hill-walking experience, most should be able to complete it. Nearest Airport: Transfers from Innsbruck Airport to Lech take approximately 1 hour 45 minutes. Running parallel to the River Lech, the Lech River Trail was established in 2012 and is a relatively easy long-distance hike, ideal for those looking to gain experience in the Alps. Beginning at the Lech’s source in Austria, the route passes royal castles, wild river landscapes and one of the largest colonies of Alpine Ibex in Europe before finishing across the border in Germany. Nearest Airport: Transfers from Innsbruck Airport to Mayrhofen take approximately 1 hour 10 minutes. Subdivided into stages and involving over 13,100 ft of ascent, the Peter Habeler Route is suitable for experienced mountain walkers only. Named after an iconic local mountaineer, the route circumnavigates the western Zillertal Alps, rewarding hikers with beautiful pastures and lakes, as well as plenty of opportunities to see ibex and marmots. Nearest Airport: Transfers from Geneva Airport to Chamonix take approximately 1 hour 10 minutes. One of the most iconic hikes in Europe, the Tour Du Mont Blanc (TMB) covers an impressive 170 km and passes through France, Italy and Switzerland. Normally walked in an anti-clockwise direction, the route circumnavigates the entire Mont Blanc massif, taking you through several famous villages such as Courmayeur in Northern Italy. Whilst the traditional route is completed over 11 days, there are plenty of route variations to suit all abilities. 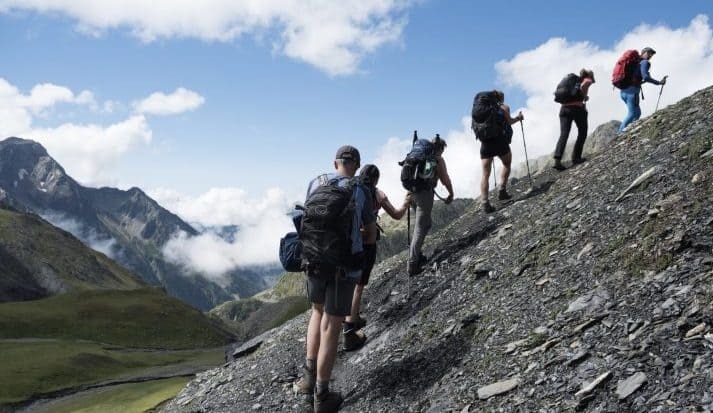 Routed through contrasting landscapes including a few 4000-metre glaciers, the Walkers Haute Route is one of the most spectacular hiking trails in France. The best bet is undertaking this walk in summer. The route was established by an English mountaineering crew in the mid-19th Century. Also known as Mont Blanc to the Matterhorn, hikers will travel from Chamonix to Zermatt and pass snowy peaks, lush green valleys and fairy-tale villages as they walk. 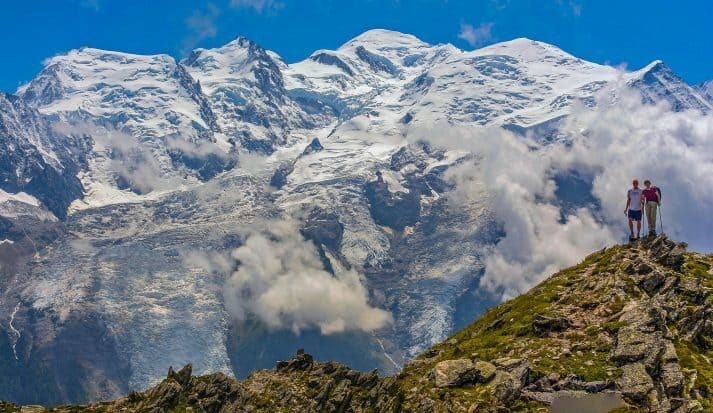 Extremely popular in the summer months, Lac Blanc is an exceptionally beautiful day-hike which can be successfully completed by hikers with a reasonable level of fitness. Starting from Chamonix, hike to a stunning aqua-blue glacial lake that boasts spectacular views over the Chamonix Aiguilles, Les Drus and the Verte. Featuring a mirror image of Mont Blanc in its calm waters, Lac Blanc is a must when staying near Chamonix. Nearest Airport: Transfers from Geneva Airport to Bourg D’Oissans take approximately 2 hours 40 minutes. Set in France’s largest and highest National Park, Park National des Ecrins, Tour des Ecrins is one of the most challenge alpine hikes in Europe. Carving a circular route through the park, hikers will experience jagged peaks, tumbling glaciers, cascading rivers and steep-sided valleys. Ideal for those with a good head for heights and a reasonable scrambling ability, this route reaches heights of 2,735 metres and offers outstanding views of the Ecrins Massif and Lac Lauvitel. A classic trail, Grand Balcon Nord is one of the best day hikes in Chamonix. A must-do when staying in the French Alps, this intermediate hike begins at Montenvers and allows hikers to experience the high point of Forbes Signal, Mer de Glace glacier and into Italy’s Grands Jorasses. Ideal between July and October, expect high crowds on this popular route during high season. Nearest Airport: Transfers from Turin Airport to Cogne take approximately 1 hour 45 minutes. A demanding 10-hour hike through the Parco Nazionale del Gran Paradiso, the Sella-Herbetet Traverse hike is a stunning introduction to the Italian Alps. Beginning at the town bridge in Valnoney, the route takes you on an old mule trail to Rifugio Sella, a former hunting lodge of King Vittorio Emanuele II. Requiring a head for heights, sure-footed hikers will be rewarded with breathtaking views of spikey peaks lined with glaciers, Ghiacciaio Tribolazioni and the Gran Paradiso. Wildlife lovers will also be able to see herds of Ibex, Chamois and Marmots throughout the trail. Nearest Airports: Transfers from Turin Airport to Cervinia take approximately 1 hour 40 minutes. Famous for its beautiful lakes, take an easy 1-day hike to Lac de Goillet whilst staying in Cervinia. Beginning in Breuil-Cervinia, hikers are submerged into lush woodland before reading the northern tip of the beautiful, blue waters of Lac de Goillet. With a vertical increase of 534m, continue to walk around the lake and back towards Cervinia to get a new perspective of this beautiful region. Nearest Airport: Transfers from Turin Airport to Courmayeur take approximately 1 hour 45 minutes. A fully-immersive trek within Valle d’Aosta, The Giants Trek combines the majestic Monte Rosa, Cervino, Grand Combin and Monte Bianco. Connecting Donnas with Courmayeur in 18 stages, the route can be done in its entirety or in smaller sections if you don’t have the full week. A difficult hike on the Renaissance paths, Tour de Monte Rose provides breath-taking views of the surrounding peaks. Named by the great Leonardo Da Vinci, Monte Rosa (meaning Glacier), provides the dramatic backdrop to this incredible hike. Ideally attempted no earlier than July, enjoy the magical Snow Kingdom whilst enjoying the summer sun. Nearest Airport: Transfers from Zurich Airport to Lauterbrunnen take approximately 2 hours. Featuring no less than 72 waterfalls, Lauterbrunnental is the world’s largest glacial valley, bigger than even the spectacular Yosemite in the USA. An incredible valley loop trail, there are plenty of incredible viewpoints before reaching the village of Gimmelwald. Hikers have the option of taking the tram back to Lauterbrunnen or follow the river trail back, with waterfalls on every side. 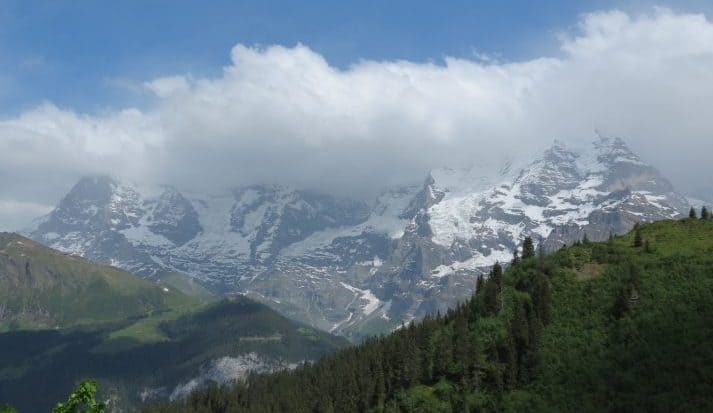 Ideal for high-level panoramic views of the Jungfrau, the Faulhornweg is one of the best day hikes in Switzerland. Boasting a backdrop of the Eiger and Monch, the hike concludes at Schynige Platte where hikers will be able to admire over 600 alpine species and 360- degree views that are amongst some of the best in Europe. Nearest Airport: Transfers from Geneva Airport to Verbier take approximately 2 hours. Away from the bustling resort town of Verbier, the Lac de Louvie hike gives hikers breathtaking views of the impressive Mont Blanc massif. Following the Sentier de Chamois (the Chamois Trail), ibex and chamois are often sighted on the rocky slopes above. Passing a beautiful gem-coloured lake and 200-year old stone barns, this day hike is a must whilst visit Verbier. After passing through wildflower-filled meadows and larch forests, hikers will be greeted with steep valley walls and dramatic views of Zermatt. Climbing above the treeline, the Höhenweg Höhbalmen hike rewards hikers with a stunning sweeping panorama of Switzerland’s highest peaks. With incredible views of the Matterhorn and the Zmutt glacier, this hike is one of the best in Switzerland. When is the Best Time to go Skiing in Colorado?